New Delhi was a place we wouldn’t wish to go to again. Although there were some beautiful buildings there, which we are glad we got to see, a few days was enough for us. It is just too busy and you get no peace! Our best day was when we were treated like royalty, when we walked into the Iskcon Temple. This is a Krishna Temple. We walked in to have a look around, and noticed people were cueing for something, so we cued also. A man came over and rushed us to the front of the cue. They were all being served food, before a worship service. We tried the desert, which was very similar to rice pudding. They were so kind to us and showed us around. It was so nice to get away from touts and the hectic city, at least for a while. We got the train from New Delhi to Agra Monday morning. We took a autorickshaw (taxi) from Agra cannt station to Agra Fort station, as that was where our train was going from the next morning. The driver tried telling us there were no hotels in Agra Fort, and that he would drive us to the station in the morning. Well there were loads of hotels in Agra Fort, he was just trying to get more money out of us! 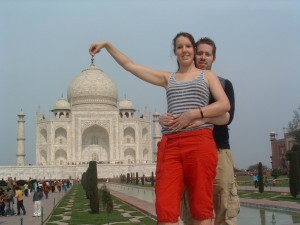 We went to see the Taj Mahal on Monday afternoon. The building and grounds are stunning. A man came up to me saying, do you want me to take a photo of you both with your camera, I thought he was just being nice, so said yes. Then he kept taking more, and at the end he said what tip will you give me. The cheek of him! We got some good shots so I gave him 45 Rupees (60p). Then I went over to get a picture on the Diana Seat, thinking I’d have to pay for a professional one, as its too busy there. However when I got over there, the professional photographer came up to me saying, people wanted there photo taken with me. So I decided to say ok, so long as you take a free shot for us, so he did. It is crazy how many people wanted their photo with us. Also parents were coming up to me and handing me their babies to hold. I still don’t fully understand why, if any one knows, please tell me, why this is? Well I will post more later. We are currently in Jaipur. We just arrived this morning and will be staying here for two days.